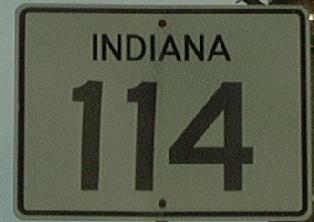 Indiana State Route 114 runs east-west in Northern Indiana. It runs in three sections. The western most section goes from U.S. Rt. 41, near Morocco, to U.S. Rt. 421, near Francesville. The central section runs from IN St Rt 17, near Fulton, to IN St Rt 25, at Fulton. The eastern portion runs from IN St Rt 13/14 at North Manchester, to U.S. Rt. 24, near Saturn. Info on IN St Rt 114 is broken down by county below.